So, Your Child is Moving to NYC? Some Sage Advice to Save Your Sanity! But take heart. Your child WILL indeed be living in the center of the universe surrounded by the best people on Earth. And even better? They will need Mommy and Daddy more than ever. That’s right! If you were one of those parents shocked to discover that you became MORE relevant in your kid’s life when they went from high school to college, just WAIT until they try renting an apartment in New York! 1) Your child is going to be fine. 2) The paperwork is insane. 3) If your kid is making less than $70k, it’s gonna cost you some money. The year was 1992. There were 2,020 homicides in New York that year compared to the 290 that happened in 2017. The fourth-story, one-bedroom apartment I rented (to share) on 19th Street and First Avenue for $850 a month now goes for $2,600 a month. And I was able to rent that apartment with zero credit history and no guarantor. So if your child making less than $70k is moving to NYC and you don’t know what a “guarantor” is, read on, because you’re about to BECOME one! The city has gotten safer, cleaner and infinitely more complicated. But the complications are necessary. As a Manhattan Real Estate Agent, I am all too aware of the New York State and City laws that favor deadbeat tenants, so I fully understand and respect the heavy precautions that NYC landlords must take to avoid falling prey to a non-paying tenant who is all too happy to ride out more than a year of eviction notices and court appearances. And let’s be honest here. Do you really want your child living next door to such a person? Barriers to entry exist for a reason! Back in the good ol’ grungy nineties, NYC landlords just wanted you to say that you had “a job.” Some landlords would call to check that you were telling the truth, others wouldn’t bother. As the sole person charged with answering the phones at my place of employment in 1992, I can confirm that mine fell into the latter category. Today, most want you to have a FICO score north of 700, a gross salary at least forty times the monthly rent and zero history of legal trouble with any previous landlord. Any and all deviations from this new normal can be forgiven with the support of a qualified guarantor who has excellent credit, makes eighty times the rent, and is willing to co-sign the lease. There’s no rule that says the guarantor HAS to be a parent, but in most cases involving young people in New York City, the person assuming liability is usually Mom, Dad or another relative willing to risk the cash. They say that all happy families are alike. In that case, NYC Landlords must be unhappy families. Because none of them are alike. Some require the guarantor to be from the Tri-State area, others are cool with any of the 50 states, while a select minority refuse to partake in the process altogether. I’m not writing this blog for my health, so here’s this week’s dose of self-serving advice: Get a Real Estate Agent, ensure that you have their best attention by promising to work with them exclusively, and rely on them to steer you to the landlord who will be most accommodating to your special circumstances. If you’re a guarantor with no income, horrendous credit due to bankruptcy and TONS of cash (happens more often than you would think), then you need that special landlord who can overlook anything in the face of one year’s rent paid upfront. Ask your agent, we ALL know who they are! And if yours’ doesn’t, call me! Above all else, don’t get yourself all hung up on what “should” make sense. In fact, as you help your child find a home in New York, you can help yourself by temporarily removing the word “should” from your vocabulary. You know that phrase “When in Rome?” Yeah, it’s time to adopt THAT mentality. Every parent wants their child to live a privileged life. Well, in my humble opinion, there is no greater privilege than living in New York. And if you’re anything like my parents, you’ve no doubt informed your children on numerous occasions that all privileges must be earned. And with a privilege as massive as NYC Residency, it’s often a team effort. So just be grateful your kid is up to the challenge and get your paperwork in order! This was my friend Carnegie Smith* extolling the virtues of home ownership in a rambling succession of humble-brags about how that right-of-passage commonly known as mortgage approval made her feel like an actual adult and fully alleviated any internal pressure to find a husband. The only child of wealthy adoring parents, Carnegie had always considered her financial independence and fiscal prudence to be something of a lark until she applied for her first mortgage at the of age 31. Of the magic three criteria, Mommy and Daddy can leap to the rescue with INCOME and LIQUIDITY, but CREDIT HISTORY – by far the most important one – needs to be built solely by the applicant. And well in advance. Carnegie fancied herself something of mortgage prodigy at first, but soon learned that home ownership among millennials has become commonplace. Having worked with literally thousands of first-time buyers over the course of the past 25 years, Elise has seen the mortgage milestone evolve from no-brainer financial maneuver to validating achievement. When you apply for a mortgage as a couple they don’t average the FICO scores, they often go with the lower one and apply it both of you. This means that one of you can get dragged down by the lower score, and that can negatively impact the interest rate. I checked with Elise who confirmed that when couples have their credit scores run in tandem, it invariably does turn into a competition. “In twenty-five years, I’ve seen exactly two ties. And the low score really matters because for approximately every 20 points down on the FICO score, the interest rate goes up 0.25%. Even though I kind of knew the answer, I had to ask if being married increased the chances for approval. Is Your Clutter Keeping You Out of the Real Estate Market? For many New Yorkers, the barrier to upgrading their residence has nothing to do with “not-enough-money” and everything to do with “too-much-stuff.” With huge salaries, tiny living spaces, and minimal time and energy for home care, this town can provide the perfect storm for heedless hoarding. Liz has been a close friend ever since we shared a Montauk house in 2010, so I was well aware of the fact that her organizational expertise extends well beyond wardrobe functionally. I called her for help when a prospective client — who was potentially looking to sell her one-bedroom condo — told me that she needed “at least” six weeks to get the place ready for me to see because the bedroom was a disaster area. I figured if I was self-deprecating enough she would relent and let me in the door immediately to do the home evaluation. So I confessed to being a slob myself and even showed her a photo of my guest bedroom that has been a virtual laundry pile for the last five years. Still, she wouldn’t budge. The six-week timeframe sounded crazy to me, but Liz took it in stride. In her years since transitioning from luxury retail management, Liz’s territory within her clients’ homes has expanded to all areas where clutter can take over. Books, kitchen accessories, and — the most frustrating offender — old paperwork; the accumulation of stuff creates a layer of exhaustion both in someone’s home and in someone’s brain. And that depletion of energy impacts everything from romance to home valuation. When it comes to the benefits of organizing an unruly home, Laura has seen it all: People who had been renting well beyond the point where they could afford to buy something finally discovering that they can easily become homeowners, cleared-out second bedrooms becoming tenant-occupied streams of revenue, and formerly problematic homes selling above asking price. So, if you’ve been holding back from putting a property on the market because the mere thought of cleaning it out provokes a panic attack, there’s one great way to get yourself motivated: Invite a non-judgmental real estate agent you trust (just so you know, most agents in this town have seen everything and are virtually incapable of being shocked!) to do a home evaluation and provide you with two numbers: The dollar amount you can sell your home for if you show it in its present state, and an estimated “post-organization” price. The great thing about living in New York City is that you don’t have to do ANYTHING alone. My prospective client took me up on my suggestion to work with Liz, who was correct in her assessment that the problem indeed went beyond the bedroom. She hasn’t let anyone besides Liz into her apartment yet, but she was more than happy to share the details of their progress. For the last twenty-two years, I have witnessed one real estate focused drama after another from the safety of my rent-stabilized perch in Murray Hill. My cheap rent has enabled me to travel the world, party like a madman through the late nineties and early aughts, reinvent myself career-wise at the age of fifty and avoid the financial sword of Damocles hanging over those paying market-rate rent that is subject to any increase the landlord can get away with. So when the guy from 2013 told me in 2014 that moving in together would entail a change of residence on MY part, his pronouncement logged in at #3 on my list of reasons to break up with him (just behind his allegiance to the Landmark Forum and his obsession with his ex-wife). Not only would my mother resent him forever, but it just didn’t make sense to give up privacy AND pay substantially more rent. Emily does a great job providing the lay of the land to those willing to do the work to secure lower rent. And let me tell you, a penny saved is NOT a penny earned. It’s more like 1.4 pennies earned because the government doesn’t tax you on money you were smart enough, and in my case lucky enough, not to spend. Friends of mine with kids have been driven out of Manhattan. Others living in emerging hot areas like the Meatpacking District have had their rents literally triple. And one friend actually gave up his $975.00 rent-stabilized one bedroom in Gramercy Park to buy a condo under construction for $615k on the Upper East Side, only to lose his job in the 2008 crash and sell the place at a $120k loss three months after he moved in. Needless to say, his comfy little bargain in Gramercy was NOT waiting for him with open arms. So clearly, my advice for HOLDING on to a rent-stabilized apartment can be summed up in a thirteen character hash tag, #dontEVERmove. But how do you FIND these elusive treasures that basically give you the same financial boost as one of those meager trust funds typically bestowed upon heirs to once-great family dynasties ravaged by alcoholism? Well, as my father as always told me, “There’s no such thing as a free lunch.” Landlords holding the keys to these gems that they legally have to sell for much less than market rate aren’t going to waste a SINGLE second of their precious time facilitating a sale. Why would they? If you had a vintage Rolls Royce that you could only sell for ten grand, would YOU waste any time selling it when there were agents who could do all the legwork of advertising its availability, showing it and facilitating the extensive application and sales paperwork? Heck no! 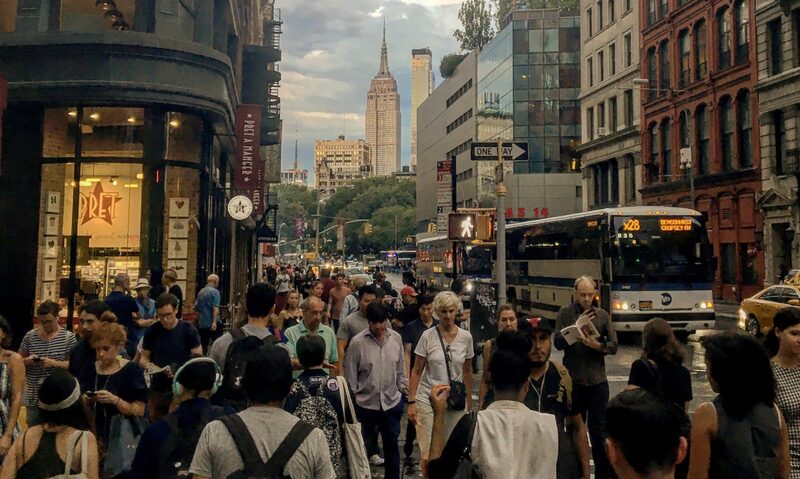 Fees vary with each apartment and there is no such thing as a “standard” commission in New York State, but the lion’s share of rent-stabilized unicorns tend to come with a fee that is equal to 15% of the total first year rent. So if you scored a two-bedroom for two thousand (it can be done), the first year’s rent would be $24k and the broker commission — that you would include with the numerous cashier’s checks brought to the lease signing — would be for $3,600. That comes to $300 a month for the first year and by year two it’s paid off completely. If you stay in your place for twenty-two years like I’ve done, that comes to $13.60 per month. Renters love “NO FEE” apartments because they don’t realize it’s just a marketing term. There are people in this world who are selfless, giving and generous enough to work for free, but those people NEVER become landlords and real estate agents in New York City. It takes work to fill an apartment and that work is worth money. With “NO FEE” apartments, the landlord pays a fee to the agent who brings the tenant to the unit, and they usually recoup the loss by jacking up the rent. So it stands to reason that no landlord would EVER pay to rent a true bargain that is well below market rate. In New York City, the best deals are listed exclusively with Licensed Real Estate Salespersons (like myself) and the only way to see them is to work with another Licensed Real Estate Salesperson who can get the listing agent to show up and open the door so you can see it before it’s snatched up. And then of course hold your hand as you provide the MOUNTAIN of paperwork that proves you’re not a potential delinquent nightmare. Is this self-serving advice? Absolutely! But it’s self-serving advice from someone who has been smart enough to serve himself well in this market. So maybe, just maybe, I could impart some further wisdom that could save you some serious cash in the short-term and long-term. But if you want to work with someone who has first-hand experience paying too much rent in this town, I hear my friend Alec is getting his real estate license so he can pick up some extra bucks on the weekends and get himself out of debt. So if you’re willing to increase your upfront moving costs in order to reap financial rewards for years to come, give me a call. But just promise me this: whoever steals your heart, no matter how great they are, just make sure to establish up front that you and your amazingly cheap apartment are a package deal! *Names changed to protect the innocent and stupid. I’m not saying the one-bedroom break-up is an animal unique to New York City, but with premium-priced square footage and an aura that attracts romantically reckless people like a magnet, NYC is definitely the birthplace of this tragic urban phenomenon in which two exes are forced to share a one-bedroom apartment in the aftermath of a broken romance. The good news is that the one-bedroom break-up isn’t fatal. If it were, many of us would be dead. Myself included. The year was 1994. I was 28, full of optimism and just starting my career. You could say that I was at that “intriguing, challenging and mysterious juncture” in life in which an inordinately large amount of romantic mistakes are made: My lease was almost up. This was before the days of having to prove to your landlord that your annual income is at least forty times the rent, so when my flight attendant roommate told me he wasn’t re-signing on our tiny fourth-story one-bedroom walk-up on 19th and 1st, it did occur to me that I could just re-sign by myself and simply live there alone. David was only there four days a month so I was used to being alone. Then I took into account my penchant for cigarettes (it was the nineties), pleather clothing (again, it was the nineties) and food (still a huge issue to this day) and realized I needed to find a roommate who could pay half the rent. His name was Brian. Cute, sweet, body like a Mack truck, and he loved the rain as much as I did! It was probably meant to be! Then… Oh wait, “your lease is up, too?” It was definitely meant to be! Nine days later, the new lease was signed. Everything was perfect. I remember laughing at all the people who said that living with someone was hard. Then in week two, things began to gnaw at me. I actually measured the space his forty comic book boxes took up and realized I had the equivalent of two-thirds of a station wagon parked in my living room. I soon realized the difference between having a single indoor/outdoor cat in a suburban six-bedroom house and having two full-time cats indoors in a one-bedroom apartment in Manhattan. My childhood cat (RIP Spencer) only used the litter box during blizzards and thunderstorms, but Brian’s feline friends had no other option. I could have lived with the hoarders living room and the pervasive smell of cat manure had it not been for the rampant cheating and the fictional dead wife. Geez Louise, you spend nine whole days falling in love with someone before asking them to move in, you’d think you would know them! In truth, the rampant cheating wasn’t that mind blowing. I found out, retaliated in kind, and then called it a day. But five months in, Brian’s tear soaked confession of a teenage marriage to his childhood sweetheart Kelly and her subsequent death in 1990 from cancer set off every last one of my internal lie detectors. And I was wracked with guilt for being suspicious, but not so much guilt that I couldn’t do a little research. As if the comic book storage wasn’t taking up enough space, Brian had set up a small shrine (complete with candles) to his late wife next to the answering machine (once again, it was the nineties) and I just had a hunch that if I took the picture of a blissfully wed Brian and Kelly out of its frame, I would learn SOMETHING. Well, what I learned is that her name was actually Sarah. After confronting Brian and pulling that one little string of truth, I watched as his entire tapestry of lies unwound at warp speed. Kelly was indeed Sarah, Sarah wasn’t his wife, and she wasn’t even dead. In fact, everything he had told me about his past on the west coast was completely false. At that time in early 1995, I was making 30k and $925.00 a month in rent seemed like a fortune. So after I got done telling Brian it was completely over, he moved into the living room, I took ownership of the bedroom, and we joined that elite club of pragmatic New Yorkers sharing a one-bedroom apartment with their former significant other. The times may have changed, but the guidelines for navigating such a dismal arrangement have not. Brian and I lasted five whole months as roommate/exes without killing each other and actually remained somewhat friendly after he moved out. And from that oh-so-lovely phase in my life, I have come up with ten basic rules that are standing the test of time as I reassure and comfort traumatized clients who have confessed (in an invariably embarrassed manner) that they are still residing with their ex. You can’t share custody of the kitchen or the bedroom. One person gets a decent night’s sleep, the other gets the couch and maintains the ability to cook and keep food in the fridge. Best case scenario is that all mutual friends will remain in both of your lives. Worst-case scenario is that they get fed up with the drama and wash their hands of the both of you. To avoid the latter, simply declare your apartment a disaster area to all friends and family. Highly unlikely you will get an argument. The last thing either of you need is for news of your break-up to show up in your Grandmother’s newsfeed. If you absolutely must dissolve the romantic linkage of your Facebook profiles, make sure you both remove “relationship status” from your public information before making the change. It’s going to happen to at least one of you. And when it does, don’t let the news be delivered “organically.” And there’s no reason for the recipient of the news to get upset or jealous. Chances are you will still be living together when the newfound romance goes bust. You know those chin-up bars people put in doorways? Well imagine something MUCH bigger squeezing in between the floor and ceiling and you get how pressurized walls work. Landlords allow them because they leave no marks. Tenants living through the nightmare of the one-bedroom break-up love them because it creates an illusion of a second bedroom. But paper thin walls are for roommates who love each other. So have your agent market the place as a “converted two-bedroom” and use headphones to ingest all media until moving day. If this rule is broken, one of you has to take the fall. Agree in advance that the person who initiates this ill-advised move has to move out within 24 hours if it doesn’t lead to reconciliation. If you think unwanted romantic overtures can ruin a friendship, just IMAGINE the damage it can do to a precarious situation like this one. Oh, there’s a great studio coming to market and it’s just downstairs? Lovely. But not for either of you. You haven’t survived months of buried hostility and ghoulish awkwardness in order to run into each other in the lobby or the corner bodega. New York is a big city. Explore it! No dates inside the apartment, or near the apartment. Ever. Above all else, just be kind to yourself. It’s a good rule for all circumstances, but when living in the wreckage of a failed relationship, self-persecution tends to come easily. You fell in love, you went for it, and it ended horribly. Big whoop. The important thing isn’t that you failed, but that you survived and you’re going to keep trying until you succeed. Welcome to New York! Two decades as a Manhattan PR Guy. Two years as a manager with The Plaza Hotel. Six months as a dog walker on the Upper East Side. One character named after him on Gossip Girl. A childhood in Winnetka. Pete’s life prepared him well for the New York real estate market. Prior to his career in Real Estate, Pete served as the Managing Director of Code Morris Omnimedia. Having guided hundreds of public relations clients over the years through a wide array of pivotal events that included successful launches, public scandals and Initial Public Offerings, Pete knows how to be a calm, authoritative presence in the face of any challenge. And as far as he is concerned, there is no challenge more worthy of time, stress, money and effort than finding a home in New York City. Pete spent more than fifteen years in the PR agency world where he represented such esteemed companies as Boston Private Bank, Immunogen, and St. Barth Properties. He has directed the disclosure process, message development, and media relations initiatives for more than 30 rounds of private equity financing totaling more than $720 million. Midway through his public relations career, Pete spent five years as Director of Communications at The New York Palace Hotel, where he served as spokesman, oversaw the publicity launch of the Michelin 2-Star restaurant GILT, and introduced the beauty and grandeur of the hotel to a vast global audience through the establishment of a multi-season relationship with the hit television series Gossip Girl. The producers of the show were so grateful for Pete’s help on location that they named a recurring character “Pete Holmberg” in his honor. He then rounded out his hotelier experience with two years in operations at The Plaza Hotel before returning to PR. With combined experience in public relations and luxury property management, Pete knows how to communicate the details of any given transaction in manner that is both fully transparent and easy to understand. A recent convert to Trader Joe’s, Pete enjoys cooking and entertaining in his Murray Hill apartment while watching too many hours of cable news. His Instagram — @PeteHolmbergNYC — is a tribute to the great love of his life, New York City. Pete can be reached via email at Pete.Holmberg@Compass.com or by phone at 917-501-7434. In Los Angeles, your real estate defines you. In New York, it merely permeates every corner of your psyche. As a Licensed Real Estate Salesperson with Compass, I witness this reality on a daily basis. Where we live determines how we live. And living in Manhattan has made me the man I am today. I moved here from Winnetka, Illinois in 1992 with no friends, no job and no apartment. Somehow I made it work while making every mistake in the book. And in the process I had some special moments. And through the good times and the bad, I always showed particularly sound judgment when it came to shelter. With this blog, I’m hoping to connect the lessons I’ve learned through life with the clarity I’m getting from working in industry where the product is tangible, the rules are defined, and the market is forced into fairness. Real estate is simple. It’s life that’s complicated. I can be reached via email at Pete.Holmberg@Compass.com or by phone at 917-501-7434. Please let me know if you have any questions!